South sudan is the most dangerous country in Africa in terms of crime, according to the 2017 Crime Index published recently by Numbeo, an online database of user contributed data about countries worldwide. 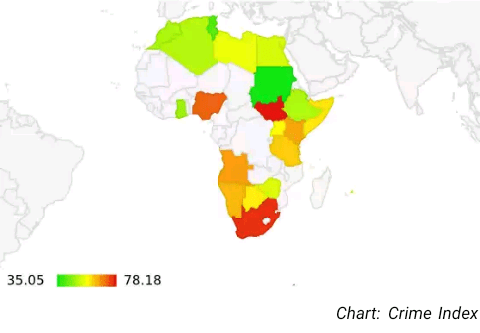 South Africa, is the second most dangerous African country, behind Nigeria, Angola. To create Numbeo’s ranking for criminality, the online database took into consideration car theft, drug use, and corruption. The 2017 ranking is based on perceptions of visitors of the website over the past three years, said Numbeo. As opposed to the most peaceful countries in africa, these are the top 10 most dangerous countries in Africa 2017.